I stroll the streets of Asmara, looking for anything that might enrich my agenda. There will be a lot of feasting this week, but as a tourist, you will not receive an invitation on your doormat. It is just a matter of fishing fur fun. Usually the music will guide you to one of the many company or community feasts organized to celebrate 18th Independence Day on a smaller scale. 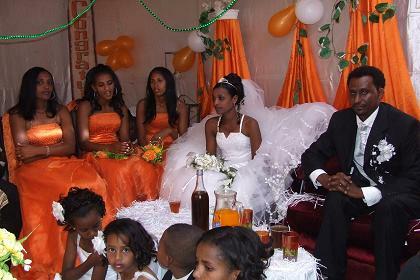 As I said, Eritrea is a social adventure, but it will only unfold if you leave your house or hotel. There will be a cultural show in Cinema Odeon this evening, but I have no special program for the daytime. So I decide to walk to and through Mai Chehot. 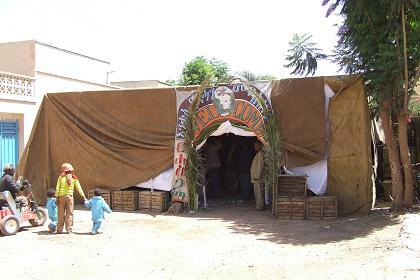 I don't know why, but it will prove to be a good guess: walking through Mai Chehot, I pass a tent where a wedding is taking place. 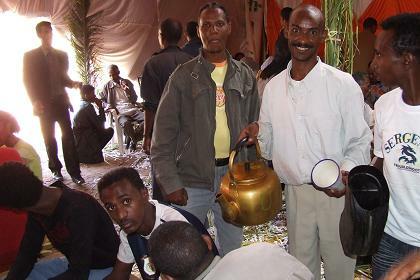 I am invited to come in, and to sit in the front, on the best chair they can find, to eat injera, drink suwa, and dance. The family of the bride explains the traditions, and translates some of the discussions between the two families, which are part of this tradition. 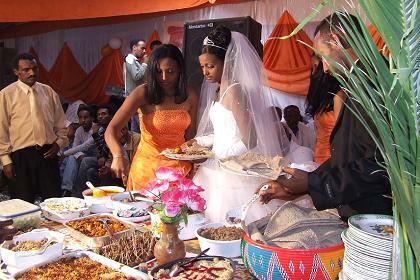 When the marrying couple enters the tent, I am treated as one of the family members, and invited to share the buffet lunch. I choose the injera with some berbere sauce and salad, and eat with my fingers, refusing the spoon. And after the lunch I accept the invitation to dance. Friendly visitors give me some advice on how to move. 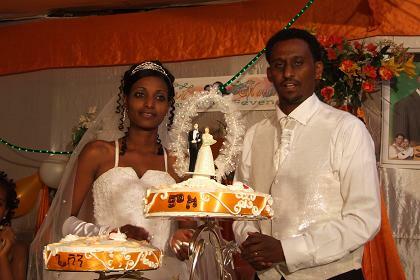 The ceremony ends at 18:00 with cake and champagne, a toast on a happy marriage. For the evening I have an invitation card for the Independence Day ceremonies in Cinema Odeon. They do not allow camera's. Every visitor is checked by the police on hidden arms before entering. A cultural show is staged with traditional music and dance of the various nationalities, and drama. 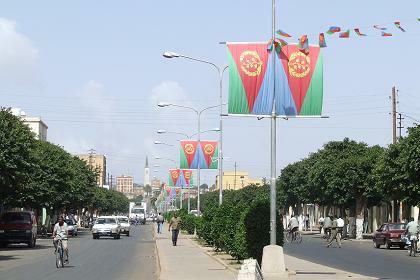 Decorated Afabet Street - Medeber Asmara Eritrea. 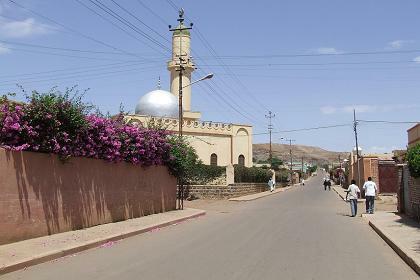 Mosque - Mai Chehot Asmara Eritrea. 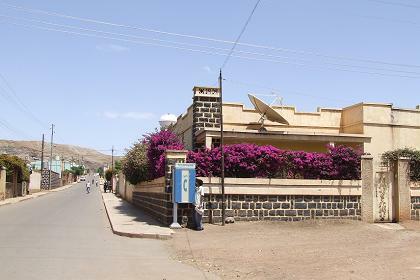 Residential buildings - Mai Chehot Asmara Eritrea. 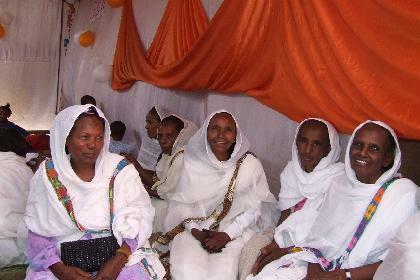 Tent for a wedding ceremony - Mai Chehot Asmara Eritrea. 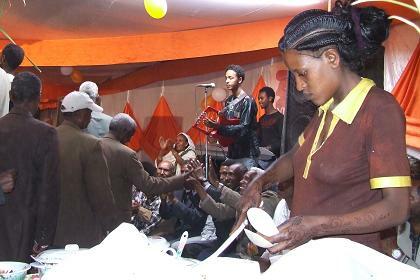 Serving suwa at the wedding - Mai Chehot Asmara Eritrea. 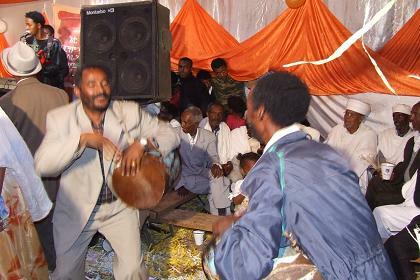 The wedding of Tsehaye and Feven - Mai Chehot Asmara Eritrea. 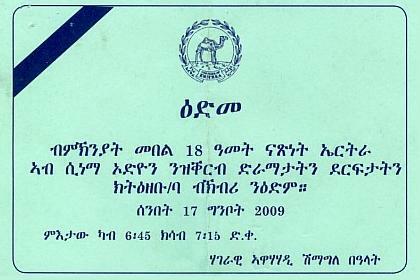 Invitation card for the May 17 ceremony - Cinema Odeon Asmara Eritrea.